In recommending this movie, I should warn you that you might very well hate it. That sounds peculiar, but while the film was a hit amongst critics (enough to earn it thirtieth place on a list of the decade’s most acclaimed films), it has plenty of detractors. The Netflix rating is just over 2 stars; a typical message board thread on IMDb simply reads “Zzzzzzz…”; when my own parents saw it last summer, my mother despised Juliette Binoche’s frantic, histrionic character, and my father fell asleep. But I liked it. Why? The division between critics and many viewers may suggest that the movie is some sort of arthouse pomposity. However, on first view the minor-key film hardly seems ambitious enough to warrant charges of pretension (I eventually revised my view, but as the ambition is quite subtle, the point remains.) The “story” follows a pampered yet seemingly unspoiled little boy whose mother, voice actress at a puppet theatre, is a nervous wreck and whose gentle Chinese nanny takes him on urban walks and makes little movies to pass the time. This plot is merely pretext for a series of tableaux, although certain events do allow us to peek at the character’s psychological underpinnings. Nonetheless, despite Binoche’s hyperactivity, the fleeting flavor of Flight serves a soothing balm rather than a caffeinated jolt to the system; while part of me misses the verve and vivacity of the French New Wave, this Gallic lassitude also has its charms. Flight of the Red Balloon is, essentially, a home movie with nice photography. If that’s not your cup of tea, look for coffee elsewhere. If it is, savor the taste. To designate the film a home movie is not to suggest shaky handheld photography, mugging for the lens, or subjective viewpoints (quite the opposite, in fact; director Hou Hsiao-Hsien's camera scrupulously keeps its distance). Rather, it's to evoke the mood of observation, of life unfolding naturally before the gaze of an unrushed onlooker. To some, home movies are the epitome of self-indulgence, something you must suffer through in the wake of your good friends' first baby (and to be fair, in such situations the cons can outweigh the pros). But to others, we happy few so to speak, home movies are avenues to the animating spirit, the undisguised life-as-lived which we rarely experience in mainstream or even (maybe especially) arthouse movies, all done up with narrative contrivance or special effects. Observation of reality is one of the cornerstones of the cinema, alongside the medium's equally intoxicating penchant for fantasy. I suspect that Hou sees the home movie in that latter light, and indeed his film is set in France - the nation which first enshrined the dual impulses of the cinematograph with the domesticated curiosity of the Lumieres and the fantastical moonshots of Melies. Because, make no mistake, while Hou's film is essentially ground out of a home movie texture, it also receives a healthy dollop of fantasy which provides definition - and gives the film its title. Hou captures both threads of French - and international - cinema history in Flight of the Red Balloon: on the one hand, sitting back and letting his cluttered little domestic scenes unfold with laconic ease and a minimum of interference, on the other, siccing a rotund red balloon on a little boy's heels, letting it float free of gravity and atmosphere alike, bobbing and weaving with melancholy languor through the crooked chimneys and leafy avenues of Paris. 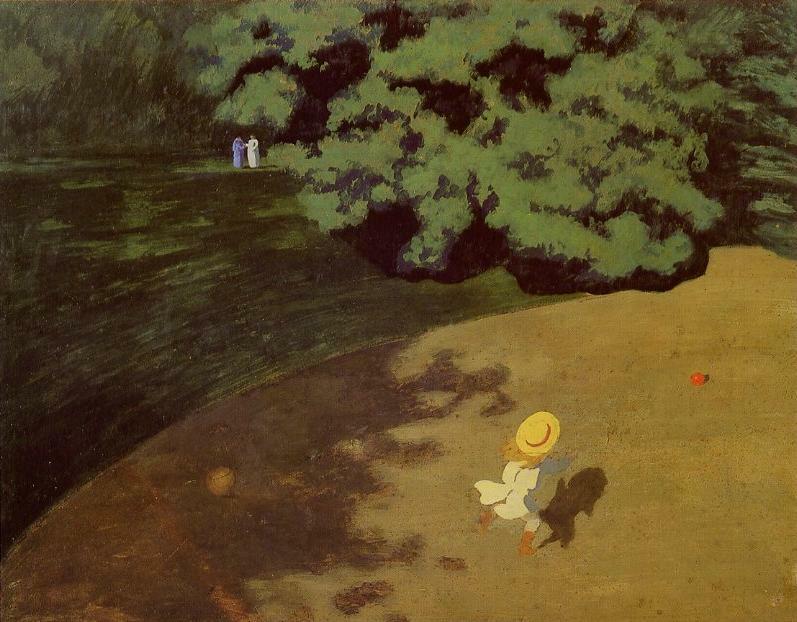 The balloon itself has a long French history - both the classic children's film The Red Balloon (1956) and the moody canvas of Félix Vallotton's painting "The Balloon" (pictured above) are explicitly mentioned in Flight of the Red Balloon. The latter work of art is the central object in Hou's closing minutes, as a field trip to the museum sees a teacher quizzing her students on the work's meaning. The multiplicity of viewpoints (are we hovering above the scene? low to the ground? ), the use of shade to express both a joyful and mournful mood (the mournful seeming to belong to the adult figures dimly glimpsed on the horizon), the lively feeling of motion present in this flat surface - all are discussed, and all, it is hinted, apply to the film itself. Meanwhile, the movie's own red balloon hovers high above the museum, "observing" through a thick pane of glass. The tragedy of the early Red Balloon was that the cruelty of the child's world (still marked by the devastation of World War II) would not allow the joyful friendship between the boy and his balloon to last. The tragedy of this new Red Balloon, while less violent, is rather awful in a different way: the very friendship is never allowed to blossom. The balloon, beckoned by the boy with a hyper monologue in the opening minutes, is always on the outside - outside the museum, outside the apartment flat, outside the speeding train. Sometimes the boy sees it, sometimes he doesn't, but he's never able to grab ahold; what's more, I don't think he ever even reaches out to grasp the string. Likewise, the film itself - despite its warmth - is distanced, almost preternaturally calm despite the chaos of Binoche's personality. While Valloton's painting evokes a bittersweet volatility and the original Red Balloon presages the New Wave (despite its rather staid style and New Waver Francois Truffaut's dislike thereof), Hou's Parisian picture is a cozy cocoon, comfortable, soothing in a way, yet queerly lonely and somehow lacking in true vivacity. To take a step back from the emotional resonance, there's a possible film-historical reading here too; Hou - himself Taiwanese - has in a sense composed an elegy for the postwar European art film, a mournful acknowledgement that the vigor of the Truffauts and Godards has mostly dissipated in favor of a calmer, yet ultimately less cathartic, experience (that sturm und drang which the vibrant red balloon heralded in 1956 has come and gone). Of course, the balloon "represents" neither the child's reticence nor (my own admitted invention) the violent birth and death of a passionate Euro-cinema. That balloon does, however, correspond to both conceptions, which suggests the robust flexibility of the symbol Hou has chosen, one iconic element amongst a strictly - or, to be more evocative, loosely - naturalistic mise en scene. I began this review thinking that, after praising the film, I would describe it as a slight, if pleasant, piece of work, probably unworthy of a #30 slot on any list of "the best films of the millennium." Yet in recollecting the movie, in reflecting on the balance between that "slightness" and the melancholy weight (ironic, that) of the title character, I'm inclined to reconsider that assessment. Perhaps Flight of the Red Balloon's weightlessness, so indicative of post-60s European cinema, such an offhand, indirect way to distract us from an emotional subtext, is its essential key to greatness - just so long as that balloon is floating on the margins, silently reminding us of what we're missing. This review was originally published at the Boston Examiner. Comments appeared on Wonders in the Dark, where this piece was linked in December 2009. Great review. I think I liked the film even more than you. I was going to post a my own thoughts on it in the next couple of days if you're interested. Thanks, Stephen - and I'll look forward to your own thoughts. But sadly I didn't care much for this film at all, which surprised me in view of my high regard for this director. I thought too much was read into a story with a (deliberate) dearth of narrative substance. The metaphysics were there, but the film didn't incorporate them into the laborious story, which in the end went nowhere, showcasing pretentiousness of the highest order. Yes, it's a snorer for sure, and I can well understand how your parents felt. The original RED BALLOON by Albert Lamorisee is one of the great joys of the cinema, and my fondness for it shows no bounds. FLIGHT is a dire homage, methinks. Thanks, Sam. As for the movie, I knew you didn't care for it, but not that you loathed it that much! The film grew on me afterwards although I enjoyed watching it (just sort of sitting back and watching life flow by - with Binoche providing the necessary tension now and then). Only later did its thought-provoking significance dawn on me. I also forgot to mention that I've seen no other Hous, so I've nothing to compare this to! Glad you liked the review, though. My review is up. It showcases my own "pretentiousness of the highest order". I'd be glad for some feedback if you have time. Joel -- just realized I didn't have your blog in my RSS reader and quickly remedied that, so I'm catching up on your older posts. First off, that was a great, well-written review. You made plenty of points that lend me some new ways of looking at a movie that I initially didn't enjoy. I think you encapsulated the film perfectly when you say "Flight of the Red Balloon is, essentially, a home movie with nice photography." Without a doubt, Hou has a great mastery of the camera -- his colors and compositions are outstanding. So much so, that I actually felt I must be crazy for not liking the movie, only to watch it again and still end up with the feeling that I was missing whatever it was that makes it worthwhile. I think in the end it was the lack of any emotional connection to any of the events going on that did it in for me. I tried so hard to read into the piano tuning and the puppet show, but I really got nothing out of those. I needed something to latch onto and as much as I love Binoche, her character never really provided it. The most I could get from it was the view of Song as an outsider and as a surrogate for Hou, which you also pointed to. Or, perhaps it was due to the film evoking the original story of the Red Balloon and then not ever following through on that to my satisfaction that irked me. Ha -- I could have kept this short and said that I agreed with the initial line of your review after all (although "hate" would be a strong word for my reaction to the film). Yeah, I don't think I LOVED the movie, but I liked it, and it grew in my estimation afterwards. Crucial to that liking was not coming to it with high expectations (though obviously I hoped I'd enjoy it): I'd never seen another Hou film, and my parents had already expressed their disenchantment with the film. So I didn't have much room to be disappointed. Keep commenting - even if it's on older posts, I'll see the notification and get back to you. I'm a big fan of keeping old entries alive.